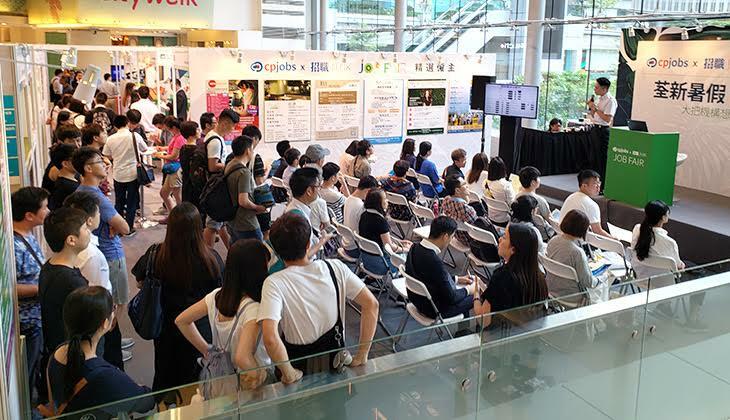 The latest edition of cpjobs/JiuJik Job Fair, jointly organised by cpjobs.com and JiuJik, took place at Citywalk 1, Tsuen Wan on July 30 and 31. The event attracted more than 1,500 visitors with over 30 exhibitors in attendance to provide jobseekers with the opportunity to meet potential employers face-to-face. One of the largest and most established recruitment events in Hong Kong, the fair brought together some of the biggest names in the city’s private sector from a wide range of industries. Among these major players were Ricacorp, Swire Resources, Cathay Pacific, Adidas and HKT Teleservices. In all, there were more than 1,000 job vacancies on offer at the fair. Those looking to carve out a career in the public sector were not disappointed either. Three government agencies, the Immigration Department, Hong Kong Correctional Services and the Customs and Excise Department, had booths at the fair to meet prospective jobseekers. In addition to earning a secure living, working in the public sector can be a most rewarding way of contributing to society. Staff from the three agencies gave separate talks on their respective career prospects, outlining job descriptions and the recruitment processes. Recent editions of the fair have seen a marked increase in the number of first-time exhibitors, reflecting a growing preference among employers for face-to-face interaction with candidates – many first-round interviews are offered based on brief meet-ups at fairs. Participation can also help build a strong brand awareness among jobseekers. Leung said that Williams Lea Tag were aiming to reinforce their back-office team. “We provide our clients with top-notch back office support,” she said. “Our services are mainly related to general office, mailroom, administration, desktop publishing and reprographics. To keep up our good work, we need to strengthen our team on a regular basis and that is the very reason the company attends this fair. Another newcomer to the fair was Hong Kong Adventist Hospital (Tsuen Wan). Ever since its establishment in 1964, the hospital has served the Tsuen Wan community. Tracy Pang, HR assistant at the hospital, said its recruitment drive had previously been mainly focused on newspaper advertising and the job vacancy page on its own website, meaning taking part in the job fair constituted a more pro-active approach to attracting employees. Designed as a comprehensive recruitment event, the cpjobs/JiuJik Job Fair aspires to be a one-stop shop for career changers, students and graduates alike. On top of an impressive list of exhibitors and an informative series of presentations given by career experts, there is also a free CV Surgery, where applicants can have their CV or application form checked and receive professional advice from expert CV consultants so they can market their work experience and skills more effectively in the future.